Weldaid Safety And Signage Pvt. 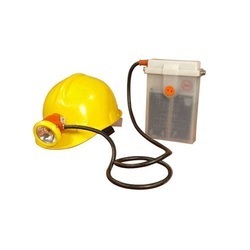 Ltd.
- Helmet with lamp bracket and head lamp with battery(12 V) which can be recharged. - Clip-on accessories like Earmuff, Welding Visor and Face Shield without drilling. A very innovative design of lightweight Helmet with lamp. It consists of EN/ IS/ DGMS approved helmet with Lamp head having adjustable mechanism to guide and lock the beam in 3 -4 different vertical positions. A basic necessity for the work men at mines, railways, workshops, tunnels, inspection crew, etc. LED ensures extra added features. This system can charge on electricity as well as on solar. Rugged tough master piece by Om Energy Savers. - LED consumes less power hence long backup with lot of energy saving. Our range of Safety Helmet with Torch has been tested by the national authority. These helmets are available in various colors and are manufactured using quality raw material which ensures their durability. 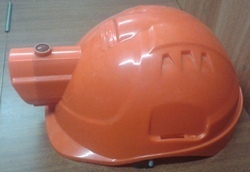 These helmets arewidely used at construction sites, mining, engineering and allied industries. We are the leading manufacturers and suppliers of a very high quality and premium range of Helmet With Lamp.